Coloradoans call it mud season; others call it shoulder season. Either way, we took a road trip to Steamboat Springs in October when prices are right and the fall weather can be spectacular. 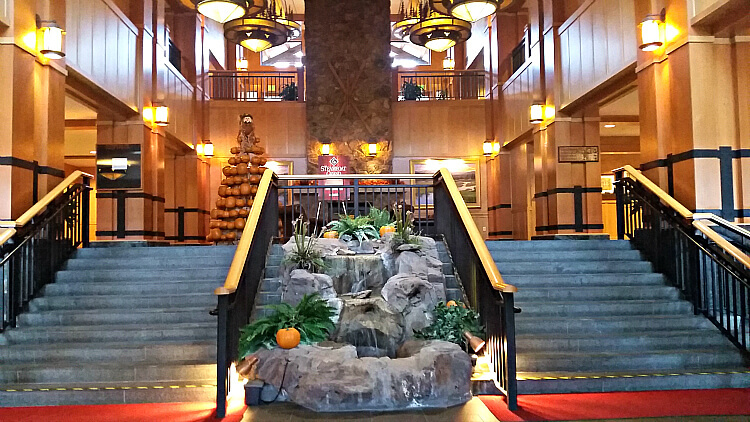 We already knew that traveling during this “off” season is perhaps the best kept secret, but we also discovered the Steamboat Grand and its Colorado mountain hospitality stayed strong. Located in Colorado’s Yampa Valley, Steamboat Springs is just 160 miles northwest of Denver and 90 miles north of Vail. The Steamboat Grand is located near the Ski Time Square and Steamboat Gondola. With an impressive view of Mount Verner in Steamboat Village, Steamboat Grand greets guests with a big Rocky Mountain welcome. Free self-parking is available across the street within walking distance, or underground parking and/or valet is offered for an additional charge. The exterior of the Grand is mountain architecture at its finest, blending in with the Colorado Rockies backdrop, with wood and rock accents. The porte-cochere features a circular driveway and the bell staff were at the door welcoming us, even though it was shoulder season. Upon entering the first floor, a water feature with stairs on either side leading up to the Grand lobby. The reception desk is to the right, and again, the staff greeted us quickly and were very accommodating. We were attending a wedding taking place later that evening in downtown Steamboat Springs, and the staff efficiently provided us the details of the meeting time. 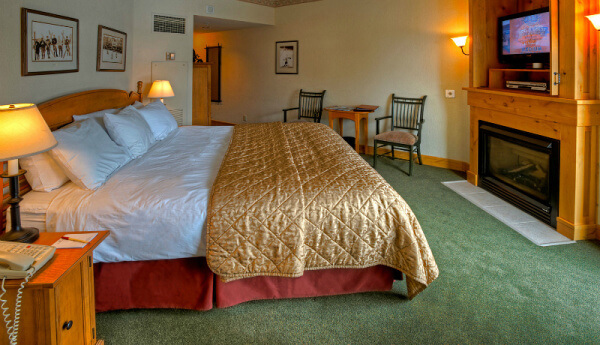 As most hotels and resorts in ski resort towns, the Steamboat Grand is a combination of 327 guest rooms, suites and one-, two- and three-bedroom condominiums. With its wood furniture, western-themed bedding and vintage ski-themed photos, the guest rooms channel the Old West roots of Steamboat Springs. Each room is equipped with flat-screen TVs, DVD players and complimentary Internet access. We stayed in a deluxe king bed room and featuring a fireplace and balcony. Although the hotel room was a bit smaller than others resorts, such as the nearby Sheraton Steamboat Resort, honestly, who spends a lot of time in their rooms? The bathroom is separate and included a whirlpool tub for 2. Unlike other resorts, this tub was indeed built for 2, plenty of room to get a soak in. Condos are made for families to spread out and include granite countertops and full kitchens. The Steamboat Grand features a fitness center, full day-spa and large outdoor heated swimming pool, open year round. During our stay, the hotel was undergoing staged renovations with 2 of the floors and the pool area closed, but since we were attending the wedding, this was not an inconvenience. Our post-wedding event was held at the Cabin, the restaurant just off the Lobby. The service was over-the-top. Even though it was “mud season,” the staff stepped up, and with an early closing due to the off season, the bartender asked if we’d like to preorder pizzas, offering to make them ahead of time and put them in the oven himself after the kitchen staff left. We ordered ahead and the wedding party was able to dine late night. 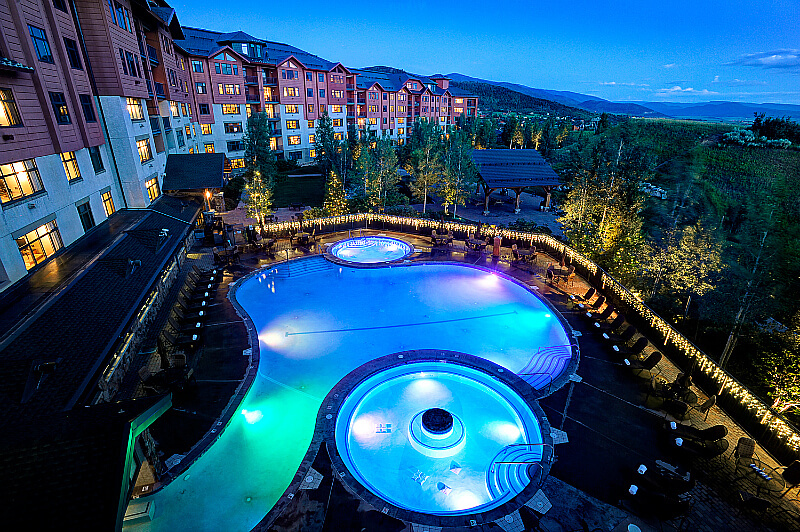 If you’ve never visited Steamboat Springs, put it on your travel list, and add a stay at the Steamboat Grand, a deluxe mountain resort in the heart of Colorado’s ski country. Book directly with the hotel on their website or you can make reservations through Expedia, Travelocity or other booking sites. Photos courtesy of Steamboat Grand and Diana Rowe.